We guarantee that Golden Leaves will cover the full cost of your cremation funeral, whenever the time comes. Protect those close to you from the stress and expense of arranging your funeral with a guaranteed Golden Leaves pre-paid plan. Today, planning your funeral service and pre-paying its costs in advance is clearly making more sense than ever before and is one of the most thoughtful things you can do, taking away the financial worry from your loved ones at an upsetting and difficult time. Our range of FROM50 Funeral Plans offer a straightforward, affordable way to plan and pay for the funeral you want, with our Golden Leaves prices guaranteed. Our From50 Plans will guarantee to cover the complete cost of your Golden Leaves cremation funeral when the time comes, regardless of the impact of funeral inflation. If a burial is your desired funeral choice, your plan will pay a contribution towards the costs of cemetery and burial fees. We offer a comprehensive range of options and payment plans so you’re sure to find one that suits your budget and requirements. However, should you wish to add any particular services not covered in our standard plans, our helpful team can produce a bespoke plan just for you. Contact Golden Leaves today for secure and accessible funeral plans. This, our most basic plan, provides a direct cremation service for a no-fuss approach at an affordable price. The simplicity makes for a worry-free arrangement. This straight-forward plan provides the professional services of a funeral director, a hearse to meet the mourners and a plain coffin. A traditional funeral for peace of mind. This plan provides a simple cremation service, including professional funeral director services, a hearse for the mourners, a basic coffin and a contribution towards disbursements. The Silver Plan provides all the elements of the Bronze plan and guarantees the full cost of a cremation funeral including crematorium and clergy fees. The Gold Plan provides all the elements of the Silver plan, plus an update to a standard coffin. This plan allows one limousine to transport mourners and family to and from the service. Our top of the range plan incorporates all the elements specified within the Gold Plan plus an upgrade to a high quality coffin and an additional limousine to and from the service. Recognised for innovation, Golden Leaves was one of the first funeral planning companies to launch the product in the UK in 1984. Golden Leaves is a founder member of the National Association for Pre-paid Funeral Plans (NAPFP) and helped establish the FPA which regulates funeral plans within the UK. Single payment by debit/ credit card or cheque. Security of the Golden Leaves Trust Fund. Pay over 12-60 months by direct debit (min £250 deposit). Fixed monthly payments that never increase. Available to people aged 50 to 75. * Not applicable for Copper Plan. With all funeral plans that are paid by way of Fixed Monthly Payments, it is possible (depending on how long you live) to pay more into the plan than it pays out to provide your stipulated funeral services on death. However with our new From50 Funeral Plan we have sought to alleviate this problem. 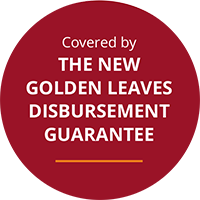 Due to our plans unique Overpayment Rebate Benefit feature, if the sum of the Fixed Monthly Payments you have paid in total more than the sum paid out to Golden Leaves Limited to fund the funeral service on death; your estate will be eligible for a rebate of a percentage of this amount. The rebate of up to 100%* of the overpaid premiums depends on the type of plan and age of the plan holder at time the policy is taken out and the date of death.